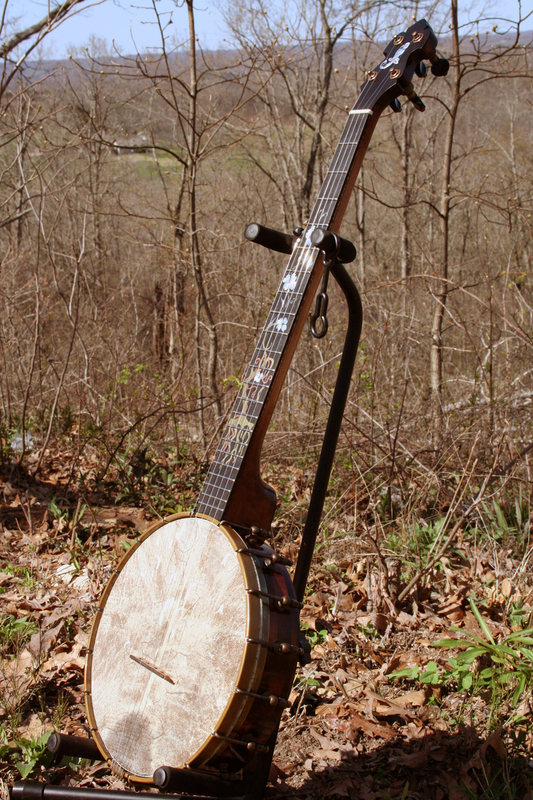 The Snowbird Custom SBC18001 is personal banjo for Jeremy Myers made of a hard Missouri maple rim and tiger striped maple neck. The rim is an 11″ and the fretboard and headstock are gaboon ebony. This banjo has a new feature that was new to my woodworking skills, the backstrap on the headstock back plate that extended down the neck. The fretboard has a unique combination of Mother of Pearl (MOP), Abalone, Brass, and Copper. The Dogwood flowers are engraved and are accented by the green Abalone stems. On the headstock the first banjo having the new “Snowbird” owl that is a Snowy Owl having the plumage that appears to flow like the old Vega banjos and their gryphon. This new Snowbird is the new trademark for our company. The inlay is a special design for Jeremy Myers having a deeper meaning. The story of the fretboard inlay is related to the human story. As most of us carry some kind of baggage, we can get overwhelmed with the details of problems life brings. The brass tree is our life as we try and live but the copper vine growing around it are the problems, the things that feel as though they will choke the light out of us. But just like nature, we can actually be strengthened by the vine because it causes us to reach higher for the light. We outgrow the vine. When we reach the point where we bloom, we can step back and look at the whole picture and see how the vine actually makes the whole picture more beautiful. It makes the life of each person have character that makes them stand out, making them more beautiful, and more unique. It’s not fun while it’s happening, but the end result shapes us into the person we are and the special purpose we have in life. The head is jamaican goat skin and the color is natural. No dyes were used on the head. The color is Aniline Dye and the finish is a Tru-Oil finish. I’m really happy with how this banjo came out! 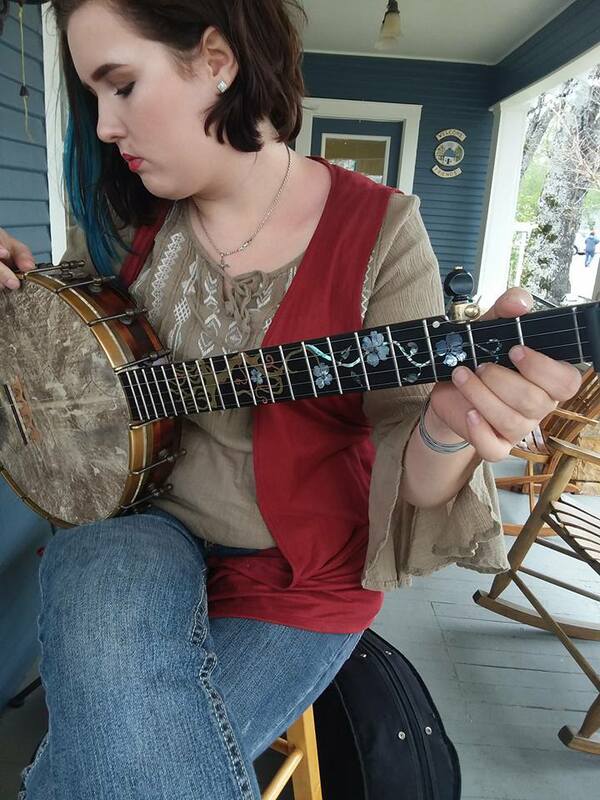 Grace Stormont tries out the banjo in Mountain View Arkansas during folk fest. Well done Jeremy, well done! Your new banjo is indeed an artist’s statement. May every instrument you make reflect the beauty and wisdom of your heart. Thank you so much Craig! You had a hand in this too, your conversations with banjo builders videos are an inspiration to me. I plan on getting more when I can afford the extra money. Keep doing what you do, it’s inspiring!